There we were, now here we are. This time last year Yunier Dorticos had KO’d an unbeaten Kudryashov, Mairis Briedis had bored us through twelve rounds against Mike Perez, Murat Gassiev had cut Wlodarczyk down with a body shot that could be felt through the TV screen and Aleksandr Usyk had dealt with a boisterous Marco Huck. Hand on heart right now, could you say for definite whether there had been a knockout in the quarter-finals of the second series of cruiserweights in the World Boxing Super Series? Did you even know the cruiserweights were in the second series? The problem is belts. As beautiful as it is to see one man draped in every single piece of boxing jewellery, as in the case of Usyk, the lack of belts or obvious rewards in the WBSS cruiserweight fights this year is so evident and is killing the hype. So far this season big fights have been made and completed. Former WBC titlist and first season Super Series semi-finalist, Mairis Briedis has decisioned Noel Mikaeljan, former WBO champ, Krzysztof Glowacki dominated the Russian, Maksim Vlasov, Andrew ‘The Beast’ Tabiti, for all his talent, bored an Ekaterinburg crowd to a drab 12-round victory over Ruslan Fayfer and in the best of the bouts, Yunier Dorticos of Cuba slugged it out with former European champion, Mateusz Masternak. The semi-finals are currently, Dorticos vs. Tabiti and Briedis vs. Glowacki, set to take place in early 2019. 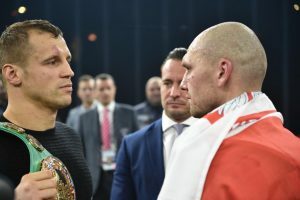 For the boxing purist, these are two exceptional fights to be made in a division living in the shadow of the Ukrainian supremo that is Usyk, who recently finished his ‘Fighter of the Year’ 2018 with a knockout of hopeful, Tony Bellew; but the 200lb limit division, and the second series of the Super Series is still steeped in talent even without the undisputed champ, and yet without the glitter on show such as, the WBC belt Briedis used to hold, or the WBO that Glowacki was once the champion of, the show is just lacking that key element that fans come out for, or watch on tv to see – The immediate reward. A champion lifting aloft a recognised, and respected title at the end of a fight. For now, casual fans will overlook the second season of cruiserweights unless they’re on the same card as say, the bantamweight-semi-final of the newly crowned, WBA champion Nonito Donaire vs. WBO titlist, Zolani Tete. Maybe, by the cruiserweight’s final, there will be vacant belts left behind by Usyk moving up to the heavyweight division, but the keyword is ‘vacant’. And maybe it won’t matter that history will show the belts as vacant, but that was the beauty of the first series, and the perfection that lies in the bantamweight version of the Super Series, a feeling of finality. That when the final comes around and is won and lost, the man who lifts the Muhammad Ali Trophy above their head is actually worthy of having their name next to ‘The Greatest’. The current feeling with this season of cruiserweights is that this isn’t the case. Let’s hope for at least a knockdown in the semi-finals.